ScummVM for Windows CE is a port of the mentioned interpreter for use with the Pocket PC and Windows Mobile platforms. It is currently actively maintained by Jubanka, following the footsteps of Arisme and Vasyl Tsvirkunov. 1 What is Windows CE? 7 Appendix A: Jubanka's "A Brief History of PocketScumm"
Windows CE is an Operating System developed by Microsoft, targeting mainly devices with minimal storage capacity. The latest stable version of Windows CE, now officially dubbed Windows Embedded CE, was released November 2006, with numerous new varations based off the CE core released under both Pocket PC and Windows Mobile trademarks. The two latter are mostly intended for use in PDAs and smartphones specifically, ergo their respective titles. The Windows CE OS is identified by its version number; 2.00 being dubbed as Pocket PC 2000, 3.00 is Pocket PC 2002, 4.2x is Windows Mobile 2003 (SE), 5.00 is Windows Mobile 5 and so on. You read more about Windows CE at Wikipedia, which new users are encouraged to do before using this port. There are two types of devices you can run the Windows CE ARM port of ScummVM with. One type being Pocket PC and features a touch sensitive screen, which is ideal to play point-and-click games on. The other type being Smartphone, which is often refered to as a mobile phone with enhanced capabilities that usually doesn't have a touch screen. While some smartphones do have touch screens, the majority don't and you will have to play the games by steering the crosshair using the phones buttons. ScummVM currently supports all Windows CE versions from 3.00 (Pocket PC 2002) and up with the ARM architecture. This includes the vast majority of Windows Mobile devices out there, with the exception that they should have enough free RAM for both the executable binary and game data to run. 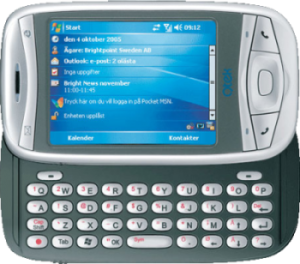 Some Pocket PC 2000 (WinCE version 2.00) devices are reported to work, although this has yet to be officially confirmed. The codebase can support all types of CPUs and WinCE versions down to 2.00, but there's currently no official builds for e.g. devices using older ARM processors (Handheld PCs, Palm Size PCs) and others such as MIPS or SH architectures. If your device uses any of these architectures you will have to download an outdated build from the download page. And if you've got the programming know-hows, feel free to contribute with a more up to date build. Support is only provided for games using a resolution at 320x200 or 320x240 as the font can get very hard to read. Should you have access to a talkie version of a game you would want to play, it would be to your avail to use that one. 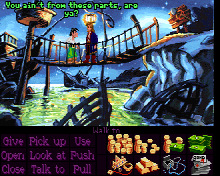 Games with 640x480 resolution such as The Curse Of Monkey Island or Broken Sword cannot be scaled down to this resolution without being rendered unplayable. Only games using a resolution at 320x200 or 320x240 are supported due to lack of downsampling scaler. All games are playable in these devices. Some landscape devices may not be able to rotate the screen around. All non VGA games should work properly on these devices. Devices with resolutions larger than VGA should be supported as the display can be resized with different scalers and have automatic screen centering. Also, VGA games will be displayed in true VGA mode. Support for the following devices is not complete, not working properly or discontinued because the device is now obsolete. Feel free to contribute and improve the port for your favorite device, or use the last release built with the previous port architecture (0.5.1) which was less resource hungry and supported more exotic devices. These devices will be supported through the GDI layer which will slow down the games a lot. You can try to disable the music/sound effects to get a better experience with a faster framerate. These kind of devices have not been tested officially, feel free to run your own diagnostics and report with your success. All available ScummVM engines are supported in this Windows CE port. See the compatibility chart for more information on which games run on each engine. It should be noted that some games, such as Sam & Max: Hit The Road, may require to have a mouse button mapped to a physical button on your device. This can be accomplished by using the Mapping utility, please read below. See here for where to obtain games. There are currently no installation software available for ScummVM, so you will have to manually copy the files and games onto your device. If your device has support for memory cards, you should really use one, as games can be up to 1 GB uncompressed. Either use a card reader or sync your device using ActiveSync to transfer the files. Linux users should check out SynCE and Mac OS users The Missing Sync for all their syncing needs. The ideal installation would be to create a folder directly on your device and place the ScummVM binary there - this way we can have different memory cards with the game data files which can be exchanged without affecting save and configuration files. Now that you've got the actual application installed, let's get those games working! As mentioned above - you may want to use a memory card for the game storage, the games can grow quite big without compression. In the ScummVM launcher, choose 'Add game...' and when the dialog asking to do an automatic search pops up, choose 'Yes'. In the next dialog, browse to your recently created \Storage Card\Games\SCUMMVM\ folder and tap on 'Choose'. ScummVM will then automatically configure the games recursively and put them on the launcher list. You may want to edit the games and remove the version information - (VERSION/PLATFORM/LANGUAGE) - as it may clutter the list and cropping the games titles, therefore you can change the title entry completely. You may also have to rename some fan-made AGI games as they might not have been added to the compatibility list yet. Since most of these games, especially the CD-talkies, will take several megabytes of space, it might be a good idea to compress them as much as possible. This can be achieved with a set of tools provided by the ScummVM team, each engine having its own compression tool. There's a couple of differences with ScummVM on Windows CE compared to the standard PC build. This section of the manual will describe the additional features in this port. The biggest difference you'll notice is the menu on the bottom of the screen. This menu helps you with standard input that would normally require a keyboard, such as saving and loading or skipping a cutscene. Opens up the in-game menu; where you can e.g. save/load, configure ScummVM or quit the application. When playing e.g. AGI games or other games with an original menu preserved, this icon will open up the game's standard menu and not ScummVM's built-in. This button won't work with games such as Simon The Sorcerer. Skips in-game cutscenes and the current character's spoken line. Mutes and unmutes the game sound, convenient in public places when you don't want to attract attention. If you need to map an action, e.g. right mouse click, to a button on your device; tap this button to open up the mapping utility. The orientation monkey is for use with rectangular QVGA/VGA devices. Tap him to make the screen rotate into three different page orientation modes - portrait, landscape and reverse landscape. If you want to hide the menu, either double-tap on top of the screen or configure a button using the mapping utility, and use it. How do I show/hide the toolbar (with Pocket PC)? Double tap at the top of the screen, twice. You may also assign a button on your device using the Key Mapping utility. Is there a virtual keyboard around? Yes, it can be accessed by double tapping near the top of the screen (Pocket PC) or by assigning the Keyboard action to a button (Smartphones). Hey, the game is stuck and I cannot quit without rebooting. Bind and use the Quit action to cleanly exit ScummVM. How do I do all those cool actions you talk about in the readme? Bring up the Key Mapping dialog once you launch a game either by clicking the key icon in the toolbar (Pocket PC) or by pressing the associated key (Smartphones) and bind actions to device keys of your choice. What are the default key bindings? Check out the port's readme (that is, the README-WinCE.txt file). I cannot see the bottom part of the load/save dialog on Pocket PC because the toolbar is obscuring it. Double tap at the top of the screen to hide the toolbar. How do I get full screen display on VGA or larger screen devices? Use a magnifying scaler (2x) from the game or global options menu. If your screen is larger than the resulting resolution, the ScummVM output will be centered in the display. What are the pointer zones mentioned in the Readme for Smartphones? Point and click to an object in the inventory at another part of the screen (e.g. USE chewing gum WITH stick). The zoning function 'remembers' the position of three virtual cursors which you can toggle through with the zone action. Ideally, one of those should be positioned inside the playfield, another to where the verbs are and one more to the inventory area. Then, performing the previously mentioned routine should be easier: Just press the zone action to warp the mouse to the next location. Will ScummVM work for my device? Short answer: If it has an ARM based processor and it is a Windows CE or Windows Mobile device, chances are that the port will run fine. Long answer: Several vendors (including Intel, Samsung, etc) use ARM processor cores for main CPUs inside their System On Chip integrated circuits, so check the specifications of your device to see if it is supported. Note that many devices can specify using a different processor, such as OMAP, but most of these are ARM based and should work. Always read the port's Readme file, which can be found in the ZIP-package you've downloaded. You should also have a look at the generic ScummVM Readme file before asking questions. If you haven't found an answer for your questions in any of these documents, please visit our forum and ask nicely. Appendix A: Jubanka's "A Brief History of PocketScumm"
I remember that Vasyl did the first port, which was just working with no sound and no specific CE features (i.e. straight port from the CVS). Then Andys from PocketMatrix forums started working on the sound, and had some success with that, but without getting officially involved in the ScummVM project. So that was early 2002 - during the next months I improved the compatibility on the different ports on Windows CE and my holy grail at that time was to have a single binary working with all screen resolutions, as well as a very easy code base to port on multiple other Pocket PC architectures (at that time MIPS and SH3 were still on the market), and a clean framework to port SDL based games on Windows Mobile. The Pocketmatrix forum community was quite useful at that time, with a lot of people always available to test the new releases (replaying full games on each release), and SirDave's excellent documentation project. This happened in 2004 but I don't remember for which release it went public. The refactoring itself was fun but of course it broke many things and the result was significantly slower and less compatible than 0.5.1, which was a little bit disappointing. So I spent the next months trying to improve that, but eventually got super busy on other things and rather bored of that never ending bug fixing and attemtps to understand the next creative way Microsoft found to break the display drivers in the next devices (the giant mess that was Windows 2003 SE and its virtual VGA resolution along with the never kept promise of a standard DirectDraw layer coming to the mobile platform pretty much convinced me to stop developing games for this platform). To conclude I'd say that all these years were pretty much fun, I spent a lot of time on these games as a child and feel happy to have contributed to such a great project than ScummVM is today. This page was last edited on 15 January 2017, at 23:10.